SACRAMENTO, Calif. – Sacramento Republic FC plays host to Liga MX giant CD Guadalajara in an international exhibition produced by Latin Entertainment on Wednesday night. Kickoff is set for 7 p.m. PT at Bonney Field. This is the third consecutive season Republic FC has hosted a Liga MX club at Bonney Field. The previous two seasons Republic FC hosted one of Chivas’ biggest rivals, Atlas FC. Republic FC is 0-2-0 against Liga MX teams all-time. Republic FC enters the match after a tough 2016 USL Cup Playoffs Western Conference Quarterfinals match on Saturday night. Republic FC and Orange County Blues FC battled through 120 scoreless minutes before the Blues ultimately outlasted Republic FC 5-4 in a penalty shootout. The loss was the first for Republic FC since a 2-1 loss to Vancouver Whitecaps FC on July 24. Six Republic FC players, including Evan Newton, Mike da Fonte, Chris Christian, James Kiffe, Elliott Hord and Cameron Iwasa, played all 120 minutes of the match against the Blues on Saturday. 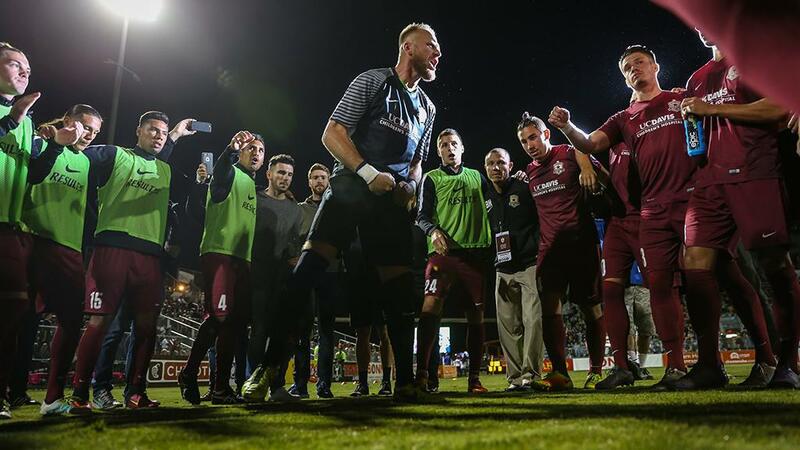 The contest marked only the second time in Republic FC history that the club had played overtime, with both matches culminating in a penalty shootout. The previous match was against the San Jose Earthquakes in a Lamar Hunt U.S. Open Cup match on June 16, 2015. Max Alvarez has been one of Republic FC’s best performers in friendly matches against foreign opponents. To date, Alvarez has a goal and two assists in international friendlies, including a goal and an assist in two matches against Atlas FC. CD Guadalajara, most commonly known as Chivas, is one of Mexico’s most storied clubs, winning 11 Primera División championships, second most of any Mexican club. Chivas is best known for its policy of only signing Mexican-born players or players with a strong Mexican lineage. Due to this policy, Chivas routinely provides several players to the Mexican Men’s National Team, including current players Rodolfo Cota, Hedgardo Marín, Oswaldo Alanís, Orbelín Pineda, Isaac Brizuela and Alan Pulido. Chivas does feature one player that was born outside of Mexico: Miguel Ponce. Ponce, who was raised and lived most of his life in Mexico, was born in Sacramento when his mother went into labor while visiting family. Ponce lived a few months in the Capital City before moving back to Mexico. The match will not be streamed, but updates of the match will be provided via Twitter @SacRepublicFC or using #SACvGDL. Tickets are still available for the match at Ticketmaster.com.